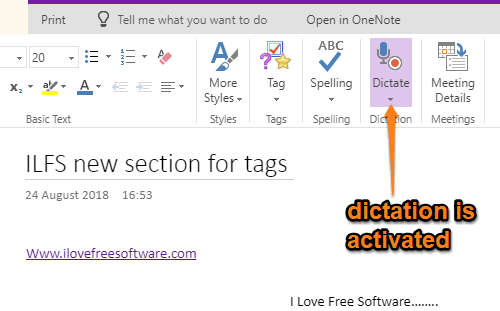 How to Use Dictation in OneNote Online? This tutorial shows how to use dictation in OneNote online. This helps you speak the words and OneNote will add those words automatically in the active page of your OneNote Notebook. So, this is similar to some speech to text software or tools. Another good thing is this is a native feature of OneNote Online. No Office add-in is needed. Earlier, this feature was available to some users only. Now, it has rolled out to all the OneNote Online users. Dictation feature in OneNote Online is available in 5 different languages which are English (U.S.), English (Canada), Spanish (International Sort), Chinese, and Spanish (Mexico). Just select a language, enable the dictation and start speaking. There are some other languages (English (India), English (U.K.), French, German, etc.) also available but those are in preview mode. You may try those languages also for the dictation. In the image above, you can see that a page of OneNote Notebook is opened where Dictation feature is visible. Step 1: Open OneNote Online and log in with your credentials. Step 2: Access a Notebook and then a page in that Notebook. When the page is opened, you will see “Dictate” icon and its drop-down menu. You need to press that icon to activate the dictation and start speaking. However, clicking the dictate icon directly will activate it with the default language. To change the language, you need to use the drop-down menu. Just like it is visible in the screenshot below. Select your preferred language and then click the Dictate icon. Now speak the word(s) and it will add them in the page. Dictation feature is really good. Still, you will need a good microphone and some silence to use it effectively. You may also learn how to take backup of OneNote Notebooks? 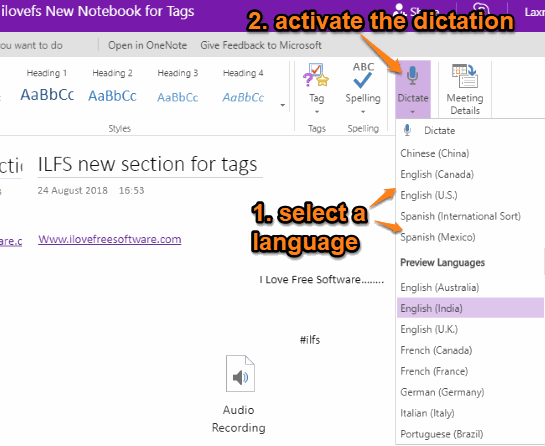 So, this is how you can use dictation in OneNote online. It is gonna help you a lot. Whenever you are bored with typing and need some rest, dictation feature can be used. Or else, there will be many other reasons you may want to try dictation in OneNote. Just activate it and start speaking.